Al's chorAl - In the news! 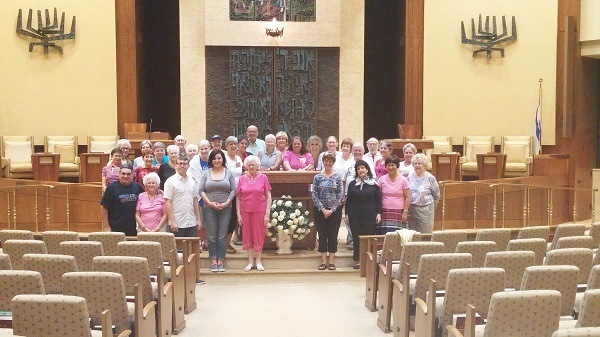 Every Monday night, a group of seniors meets at Temple Beth Shalom in Cherry Hill for choir rehearsal. But you won’t hear hymns or prayers – you’ll probably hear rock ‘n’ roll. “Rock ‘n’ roll can speak to the heart, you know,” says Gilah Lewis Sietz, who started the group known as Al’s ChorAL six years ago. She ticks off bands the choir covers: Queen, The Beach Boys, The Beatles, The Civil Wars, even Pharrell’s “Happy.” “I prefer music from artists like Eric Clapton, Pink Floyd and Guns ‘n’ Roses, but we do what the group wants,” she laughs. Knowing her father’s fondness for music, Sietz formed Al’s ChorAL for seniors – no auditions required. You only have to enjoy singing. That was good news for Marlton’s Jean Slover, who joined in January. Slover, who comes from a Methodist faith background, was attracted to the idea of an interfaith choir, where religion could be discussed, but was never the focus. The 35 members of Al’s ChorAL (a number always in flux) act like a family too – they organize rides and carpools to make sure everyone can make it to rehearsals and shows. The group performs at festivals and retirement homes, where sing-a-longs are a hit. Sietz says she’s happy the group is carrying on her father’s legacy of graciousness and respect. There were, suggests Gilah Lewis Sietz, three things that her late father, Rabbi Albert Lewis, held dear. They were music, interfaith understanding and seniors in a community. Rabbi Lewis was the legendary longtime spiritual leader of Temple Beth Sholom, president of the Rabbinical Assembly and vice president of The World Council of Synagogues. He also was the inspiration for best-selling author Mitch Albom’s nonfiction work, “Have A Little Faith,” which clearly established the rabbi as an iconic spiritual leader. Albom actually delivered the eulogy at Rabbi Lewis’ funeral in 2008 at the rabbi’s request. So determining a proper perpetual legacy and tribute was undoubtedly challenging for his daughter. “My father had dedicated his whole life to the betterment of humanity,” said Sietz, a well-known local Hebrew school teacher who also has worked for 25 years with the Adult Department of the Katz Jewish Community Center. Her challenge: To find the perfect synthesis of his passions as a perpetual tribute and legacy. Enter “Al’s ChorAl,” an interfaith singing group composed of seniors who love to sing, and who are not barred admittance by tension-producing auditions or the need for formal training. The repertoire, as outlined in a mission statement, will run the gamut from folk, jazz, gospel, rock and even rock ’n roll. That choir has quickly grown to 100 voices raised in song, and on a recent evening, those voices seemed to fill the entire interior of Temple Emanuel. In four part harmony, the singers, obviously relishing the sheer joy of their time together, even raised the roof with Beatles songs. There were smiles all around, and the timeless pleasure of music eclipsed everything else. Last year, the group, which has a volunteer board to oversee choir operations, offered its first Rabbi Lewis Memorial Concert to the public, and on Thursday, Feb. 6, a second concert will be co-sponsored by the Katz JCC Adult Department. The choral group is not without its requirements. Singers meet every Monday night. 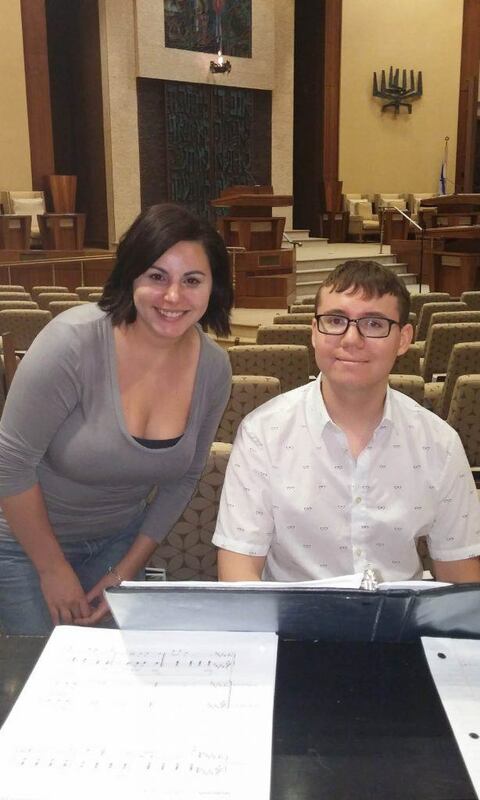 The choir formerly met at the JCC, “but they ultimately outgrew the space, which is a very promising sign,” said Marcy Lahav, JCC Adult, Cultural and Judaic director. “Now, because of its size, the group rehearses at Temple Emanuel,” said Lahav, who is delighted that a group like this for seniors exists—and thrives. But not without effort. The choral group members work with professional musician/conductor Julia Zavadsky, a native of Israel. Zavadsky, who leads choirs at Temple University and Rutgers-Camden, and also at Temple Emanuel, delights in the hard work—and the wonderful results—of the choir’s dedication. Recognizing all of that, and remembering how his beloved childhood rabbi sang his way through life, Mitch Albom was one of the group’s first donors. Others have joined in donating, but the need is still great, explained Sietz. The sweetest reward of Al’s ChorAl, said this proud daughter, is to make choral members feel appreciated, valued and uplifted. The second annual Al’s ChorAl Concert will be on Thursday, Feb. 6 from 7-8 p.m. at the Katz JCC, 1301 Springdale Rd, Cherry Hill. Tickets are $10. Gilah Lewis Sietz searched her soul for a way to memorialize and continue the good works of her late father, Rabbi Albert L. Lewis. For the 60 years he served as spiritual leader of Temple Beth Sholom in Cherry Hill, he had an uncanny ability to communicate with people of all faiths. But most vividly, she remembers him singing. "And oh, did he love to sing," she said. "All the time." So when more than 70 people - all faiths, not all singers - showed up for the first rehearsal of Al's chorAl, an interfaith, choral group she lovingly organized, Sietz knew she was right on target. Member Ann Harrison is a 62-year-old Roman Catholic from Cherry Hill, who says singing in a choir that honors a rabbi brings her closer to God. The former hospital chaplain, who relies on a walker, has sung all her life, in church and professionally. There's also Miriam Unterweiser, 87, of Voorhees, a first-time singer for whom the choir offers a vibrant social network. "This is the best thing that ever happened to me," said the former legal secretary. "I feel good when I go and I feel even better when I leave." Sietz, 54, the youngest of the rabbi's three children, came up with the idea two years ago after watching Young @ Heart, a film about a traveling group of singing seniors. She knew what she had to do: Start a choir for anybody older than 50. There would be no auditions, no fees, no regular attendance requirements - just the desire to sing. "You can show up anytime," said Sietz. A high-energy Hebrew teacher and mother of two, Sietz recruited a 16-member volunteer board to oversee choir operations, and then sought financial support for rehearsal space and conductor and pianist fees from former congregant Mitch Albom, author of Tuesdays with Morrieand Have a Little Faith, a book he based on the lives of Lewis and a black Detroit pastor, Henry Covington. "It was a fast yes," said the author, who grew up in Haddon Township, the original location of the synagogue. Albom clearly remembers his childhood rabbi's love of song and how he used singing to communicate. Even in sermons. "He would sing the phone book," said Albom. "He would make up melodies of anything." Now the choir, which gets its funding from grants and donations, will present its first concert Thursday, the fifth anniversary of the rabbi's death at age 90. Albom, who delivered Lewis' eulogy in 2008 at the rabbi's request, will attend the concert. Every Monday evening, the 52-member choir (an additional 20 come less regularly) gathers at the Katz Jewish Community Center in Cherry Hill. A piano, played by 26-year-old professional musician Stanley Fink, sits front and center. Some of the singers are sprightly, while others grip their walkers, moving slowly. Many have previous choir experiences and others had never sung a note. But what they all share, they say, is the music that allows them to forget their worries for an hour and a half. Unterweiser sings praises for the choir's artistic director and conductor Julia Zavadsky. "She is a little bit of a woman but she knows her stuff." Zavadsky, 41, barely, 5 feet tall, handily controls, cajoles, and conducts the group with savvy and a sense of humor, often making jokes about remembering the words to the songs. But she remains serious about the music, which includes show tunes, country, pop and soul, and some gospel, with no connection to a religion. "We all believe in something and we are all connected through music," says Zavadsky. Zavadsky, who holds a doctorate in music, is pleased with what she hears. "Somehow," she said, "we are making music." Somehow, she says, because the last time members like Alice Reisman sang in a group was more than 50 years ago in high school. Now, the 68-year-old from Pennsauken, a technical support person for Camden County Library, sings every week. She heard about the group from her mah jongg buddies but nobody wanted to join. "So I went alone," she said. From casual friendships grew deeper ones. "I don't want to leave at the end of the session. Singing makes me happy, more confident. " Sam Zwetchkenbaum, 51, came to Cherry Hill from Michigan, where he also sang in a choir. Here, he's bonded with other men in the group, and that has led to new friendships, often difficult for guys, he said. "But here making friends was possible." Albom said that if Lewis could be there, he would be smiling - and knowing the rabbi as well as he did, Albom is sure he would say thank you with a song. Contact Barbara Sorid at bsorid@aol.com.